Welcome To Our Home Page!!! This Is the color of lab puppies we have produced here at Johnson's Labrador Retrievers, fox red, chocolate, yellow and black lab puppies. Our Lab puppies have been featured in the 2015 Jack Daniels Calendar with country music singer Kellie Pickler. You can see more pictures of the calendar on our photo gallery page. Here at Johnson's Labrador Retrievers we provide stud service from our two boys, Remington and Hunter. If your female is in heat or coming into heat give us a call so we can go over the details of how our stud service works. 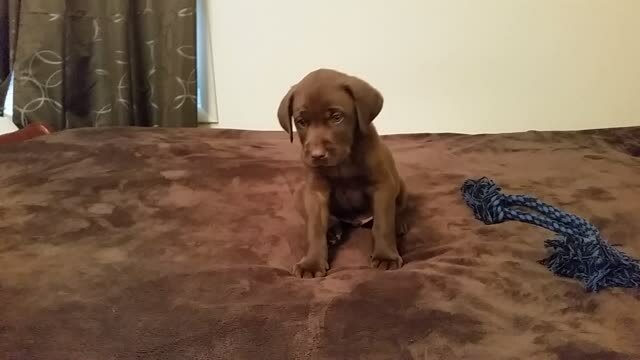 A little video of Hunter when he was a puppy! A Little About Johnson's Labrador Retrievers! Johnson's Labrador Retrievers is focused on providing high-quality service. We are AKC inspected, approved and licensed in the state of Tennessee. Here at Johnson's Labrador Retrievers we breed only top quality Labrador Retrievers. We have lab puppies for sale all the time. Labrador Retrievers are Americans top choice purebred dog. They have great temperament's, make excellent hunting dogs and are great around kids and other pets. With a variety of offerings to choose from, we're sure you'll find what you're looking for here. If you're looking for a Lab puppy right now please visit our Current Litters page to see what puppies we have available, but hurry they go fast! If you're looking for a puppy later down the road, please visit our Upcoming Litters page to see when and what color puppies we are expecting. Feel free to look around our website and if you have any comments or questions you can visit our contact page or you can call / text me (Kevin Johnson) at (615) 983-1801 anytime. We have a lot more information on our About Us page so feel free to visit there. We hope to see you again! Check back later for new upcoming litters and updates to our website. Thank you and God Bless!!! immune system builder and multivitamin for your puppy or dog. Or you can click any of the NuVet pictures below and be taken right to NuVet's website! Please note: you can only order with this order code 98050 when placing an order on NuVet's website or calling them direct.